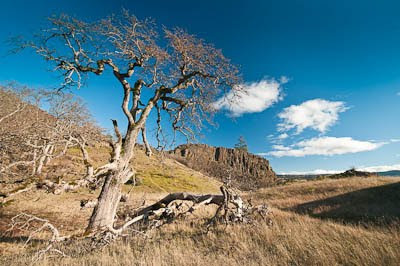 On the flanks of Coyote Ridge, just east of Bingen, Washington, is wide open oak and pine savanna with balsalt rock outcropping. It's also a haven for mountain biking. In winter, there are some very nice streams cascading from above, creating mini waterfalls through the grasslands. Having just a few hours there, I concentrated mainly on relaxing by these pleasant streams. Before leaving, I took a walk as an exploration of things that seemed interesting for my next visit. 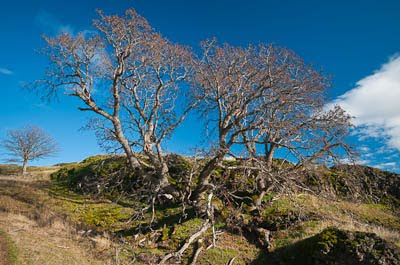 Along the path were these fine, weathered native White Oak trees. When using ultrawide lenses with a polarizing filter, you have to be careful to use them a bit more gently, unless you can have the darkest area right over your subject. 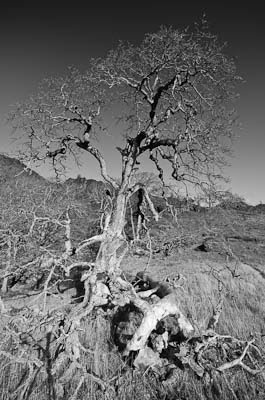 I also consider the potential of Black and White photography, especially with the mid-day light and stark contrasts.